November 2012 Horoscope Capricorn, free Monthly Horoscope for November 2012 and Capricorn Astrology Forecast for the month ahead. 2012 for Capricorn has found underutilized talents and a cleaning out of unhealthy habits. Do remember that at times too much of a good thing is not good for health, emotion or wellbeing and fewer options will make life so much easier. Capricorns want to be at the top, and they need to learn to live with solitude. Ambition, organization and efficiency are the watchwords of Capricorns, and often you tend to step on others to get what you want and the security you crave. November is a time to be chill, to use your dry wit to your advantage, and to allow others to penetrate your reserve. Let someone find their way to your heart avoid seeking approval from everyone. You just cannot fulfill a relationship any time of the year if you allow your security issues to become the major focus of your life. November is a time Capricorns must continue with their deep love for friends, family and partners. Capricorns are very secretive, but keep their friends for life and this is an awesome trait. However, Capricorns compartmentalize their life - their friends often do not know about each other. Bring them together in November if you feel they are compatible. Socialize more; stop beings so reclusive and secretive. You have a tender heart; open it. If you are single, watch for a new love interest near the 10th of November. If you are in a relationship, November brings a deepening of love. 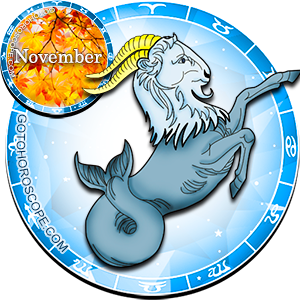 November is a great month for Capricorns to socialize in both personal and work related venues. Networking is the key word. The work you have done thus far in 2012 will give you an opportunity to be in charge. Be happy that the older you get the more rewarding financially your life will become. Plant those seeds of success this November if you haven't already! Be generous during November, Capricorn, you will find that you can influence power brokers if you are unstinting with your money during November. New contracts and agreements that have been signed during the beginning months of 2012 are starting to bear fruit in November. Keep being precise and show courage and commitment in contract matters. Keep the goodwill of your supervisors and watch for a change. You have hidden talents and these will start to be recognized. Guard your finances and be practical. Beware of taking risks with your health especially during November. Capricorns tend to be somewhat secretive and do not take care of themselves as they should. Commit yourself to better health habits and manage your energy levels. You need to be cautious that you do not lose what energy reserves you have during November; you will need these reserves for the days ahead. Visit the doctor and the dentist. You never know what is hiding in your physical self. 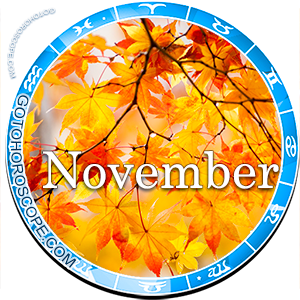 Best of all November sees Capricorns relaxing more and taking stock of the passing year while looking forward to a new beginning.